Snow days: a good excuse to bake and cook all day (if that’s what you like to do of course!). So today that’s exactly what I did. First I sent Sam off to work with some coffee cake streusel muffins. I figured since I got the day off and he didn’t, I should reward him and his fellow employees for going to work despite the nasty weather. 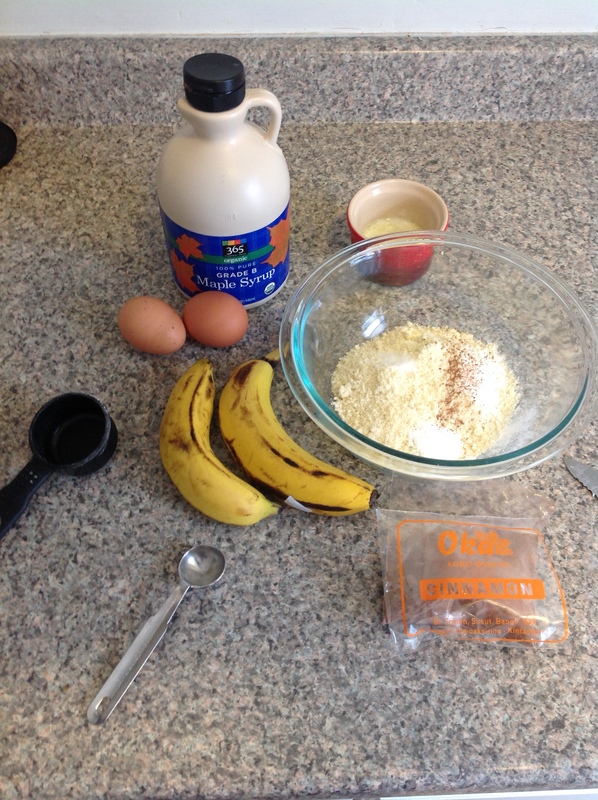 Next I used the overripe bananas to make myself a treat: gluten free banana muffins. (Side note: Thanks to my GERD issues, I have decided to go gluten-free for a few weeks as an experiment. It’s tough saying no to homemade chocolate chip cake and ham and cheese croissants, but luckily in this day and age gluten free is totally do-able.) 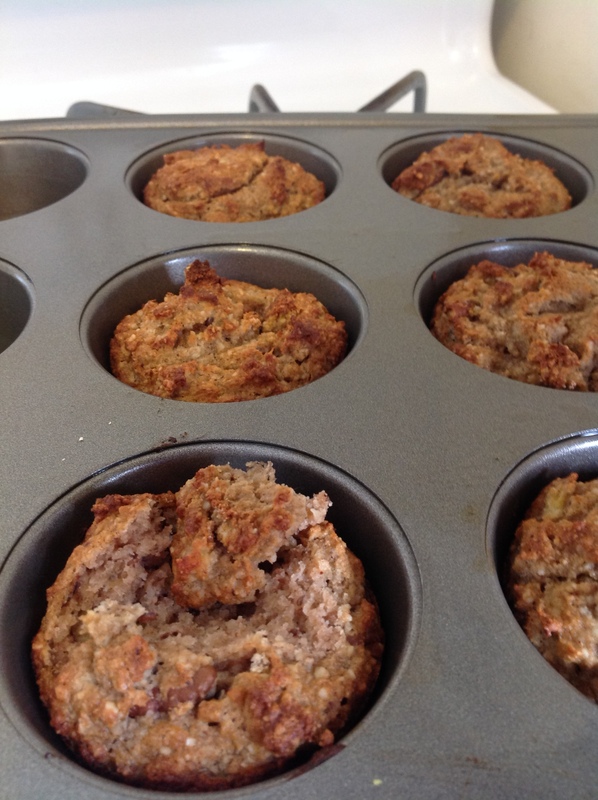 I made these muffins with coconut flour and almond meal and the bananas kept them nice and moist. Recipe adapted from here. 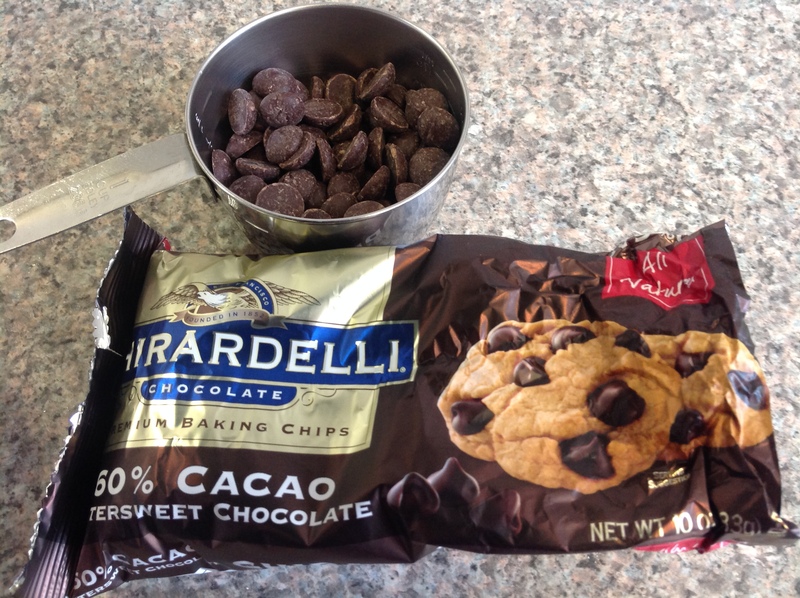 I baked them for half the amount of time and left out the chocolate chips. Great texture and flavor – chewy and crunchy, just like I like. Now close your eyes and don’t look while I add the secret ingredient. 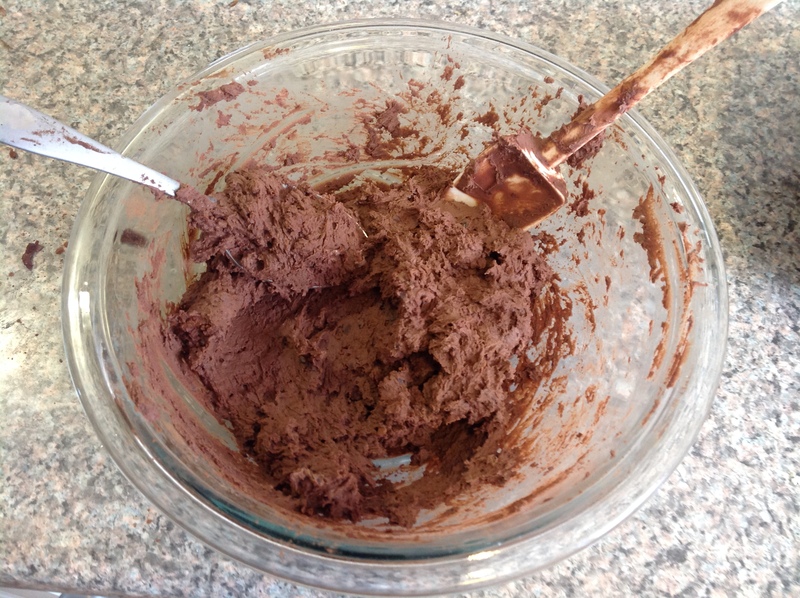 Spread out into a greased loaf pan, dot with chocolate chips and bake. 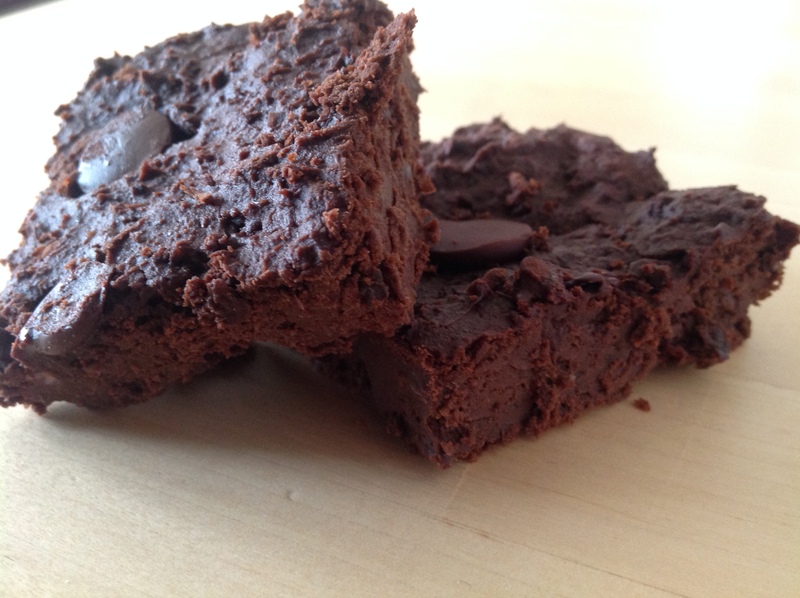 Mmm fudgy, dare I say, healthy brownies. Truth be told, they were slightly disappointing. I found them to be a little too thick and dry (the batter was really more like dough) so I might sub out milk for the Greek yogurt next time or add another egg. 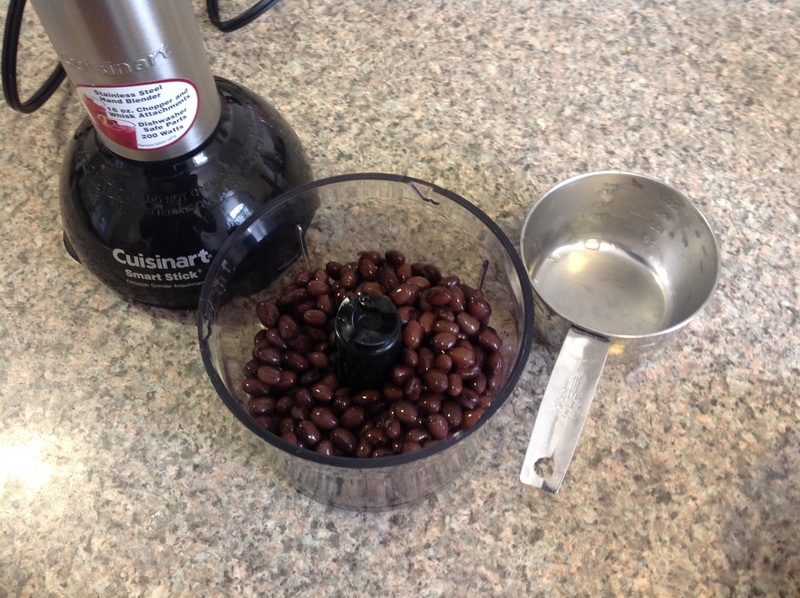 I will have to experiment with this recipe again. Recipe found here. I continued my day of baking in another house, cooking for my favorite twin toddlers. Though I know they love chicken nuggets, I have been slightly disappointed in the latest chicken nuggets I’ve made for them. Their mom also commented (kindly) that she thought they’d eat more of them if they were a little more golden brown. So I switched recipes to achieve a better flavor and color and I’m hoping this one will be a hit! 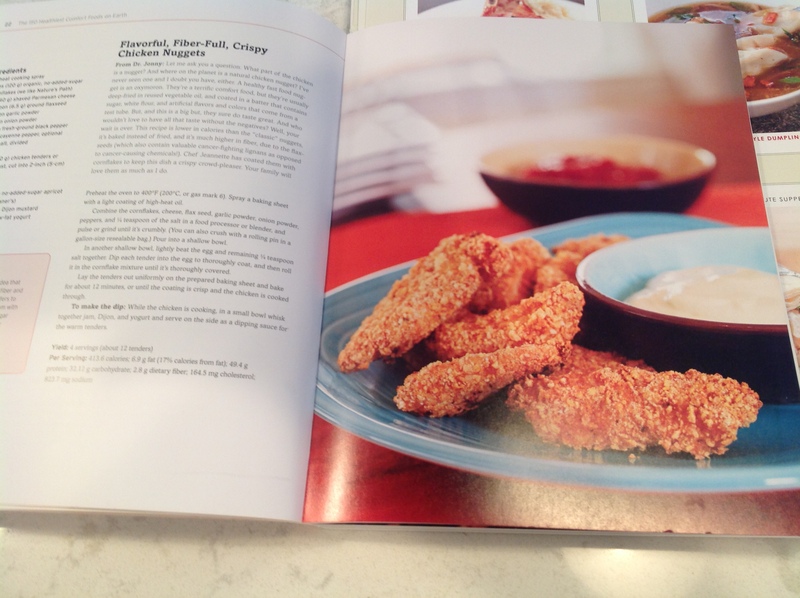 They come from a healthy comfort food cookbook and have a nice color, flavor, and crunch. I’ll share the recipe below. Hopefully the twins will like them. Cheesy and crunchy and golden! 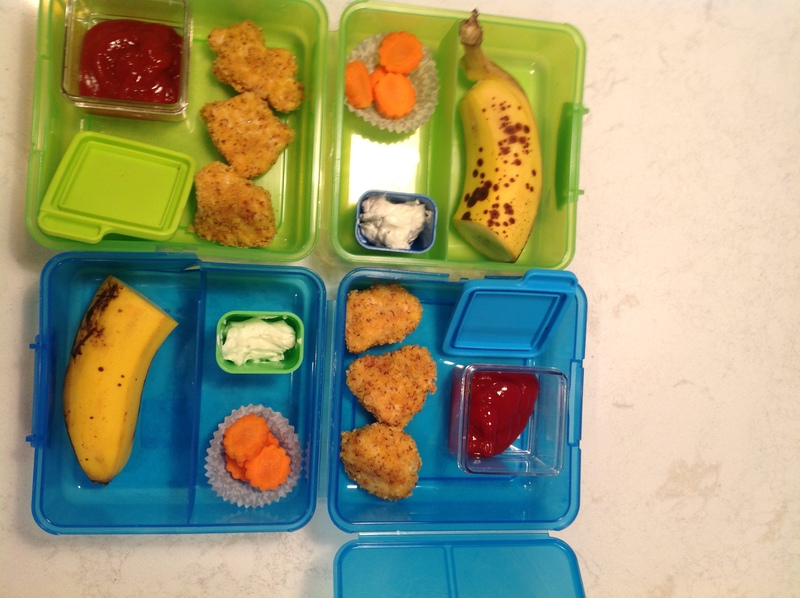 And here are their chicken nugget lunches. I have learned that in general these guys don’t eat a lot (they do have very small bodies to feed) so I try to keep lunch portions small. Lately I’ve been using the cutters their mom bought to make fun-shaped fruits and veggies. Why eat regular carrot slices when they can look like flowers? I also made them pizza rolls for dinner, which is one of their favorites, so I know these guys will eat well tonight. Now <sigh> the only thing left to make is dinner for Sam and me. Ah well, I do enjoy a good day spent in the kitchen at least. Preheat oven to 400 degrees and prepare two sheet pans lined with parchment paper, sprayed, or lightly oiled. In a wide dish, mix egg and 1/4 teaspoon of salt. In a processor pulse corn flakes until fine, then add in cheese, flax, the remainder of salt, garlic, and pepper. Pulse to mix. Alternatively crush in a plastic bag with a rolling pin. Pour into a wide dish. 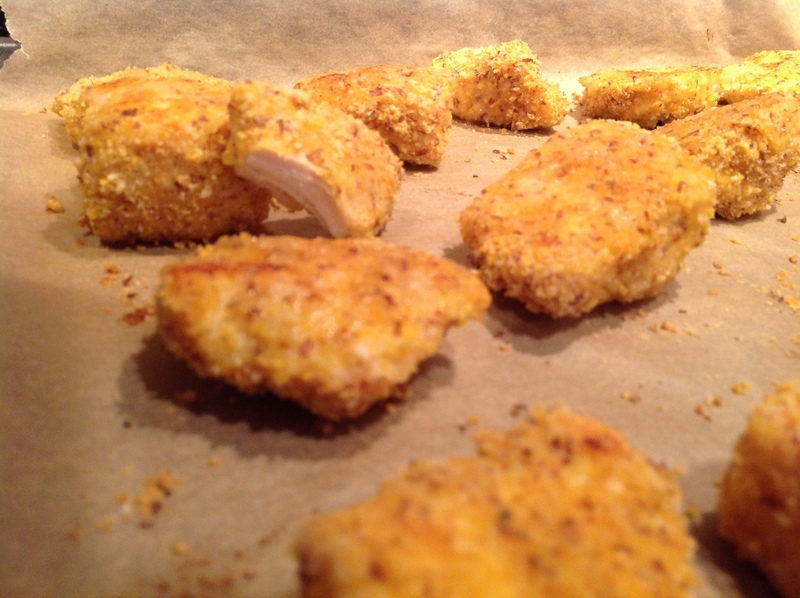 Dip chicken cubes into the egg and salt mixture and then bread in the cornflake mixture. Place on cookie sheet. 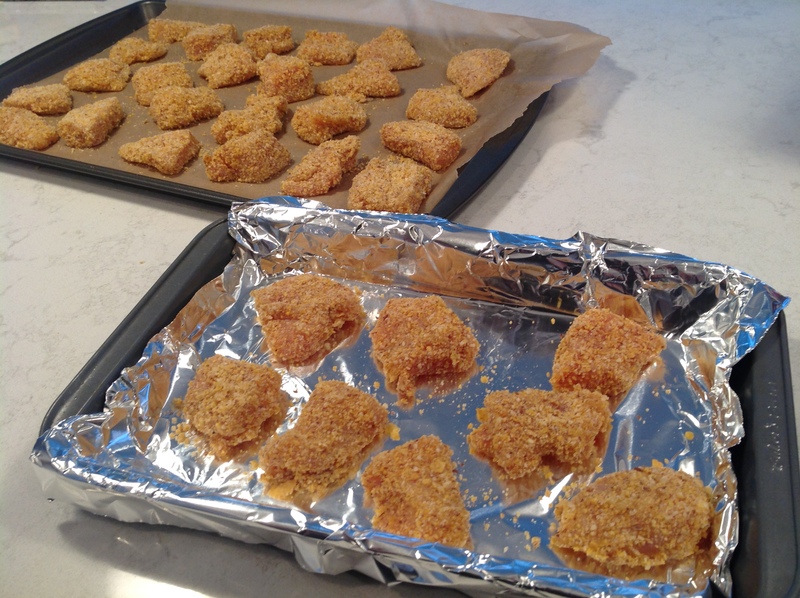 When all nuggets are breaded, put the cookie sheets in the oven and bake until heated through and golden – about 15 minutes depending on the thickness of your chicken cubes. Be sure to test the temperature to reach 165 especially if feeding to small children! Cool slightly and serve with your favorite dipping sauce. On another note, one year ago I started this blog! How much has happened in a year and how fast time flies! Thanks to all of you who follow my adventures. I am grateful to you all. Let’s just say I get more caught up in Hollywood “reality” than I like to admit, especially this gray and gloomy time of year. Commercials, television, idyllic pictures of people laughing and playing volleyball on the beach. These photographed ideals all make me want to move to the warm beaches of California, become low-key famous in some form, and live the glamorous life, because it seems just that easy. Wrong! I don’t know for sure that California, living “glamorously,” or fame would actually suit me, but sometimes my daydreaming gets the better of me. Each day passing, each moment, each vacation, each work day boils down to units of time, ticking and tocking away whether we notice them or not. The secret then is to enjoy time passing, sometimes slowly, sometimes just right, or sometimes looking at the clock and wondering where the day went. If nothing else you can appreciate life’s simple pleasures. 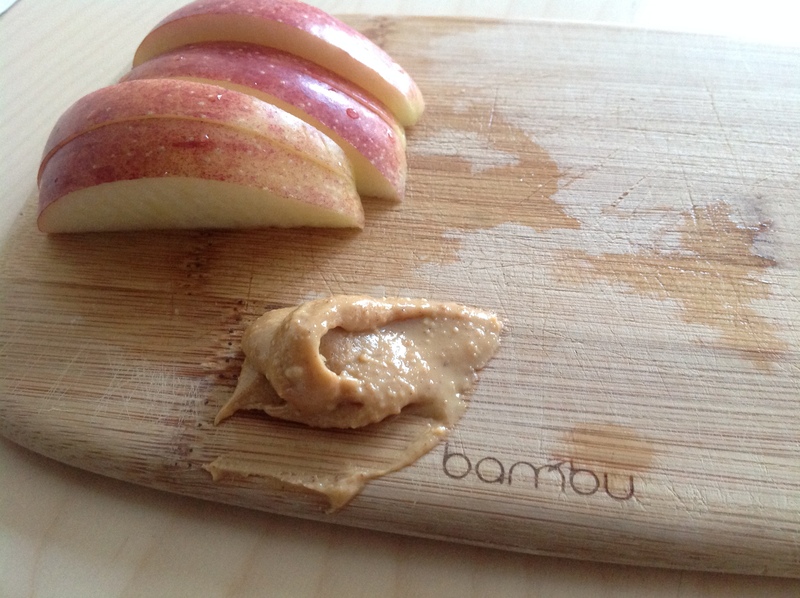 Eating an apple with peanut butter. Watching the snow fall from inside your warm house. And while Hollywood glam shots may seem desirable, don’t forget that they never show you the hard work behind the scenes. 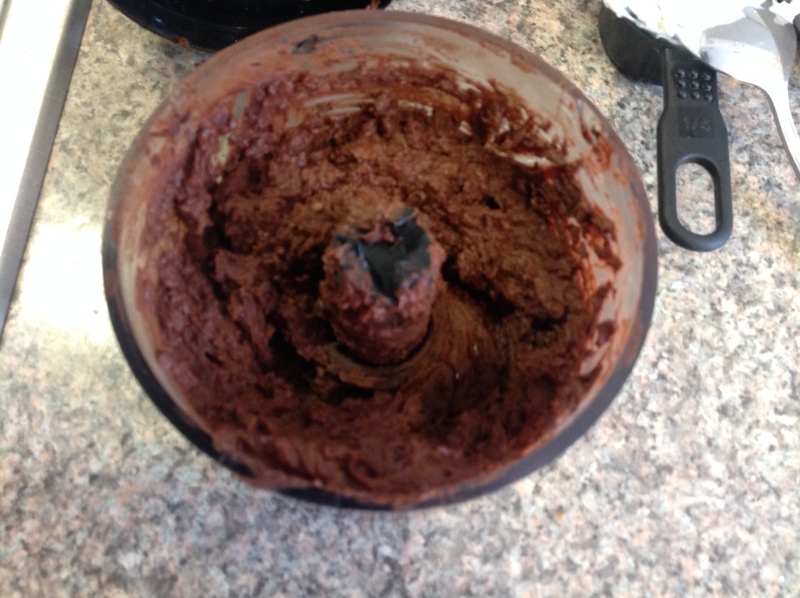 It’s like seeing pictures of a recipe in a cookbook without seeing the pile of dirty dishes at the end. It’s not all sparkle and shine. 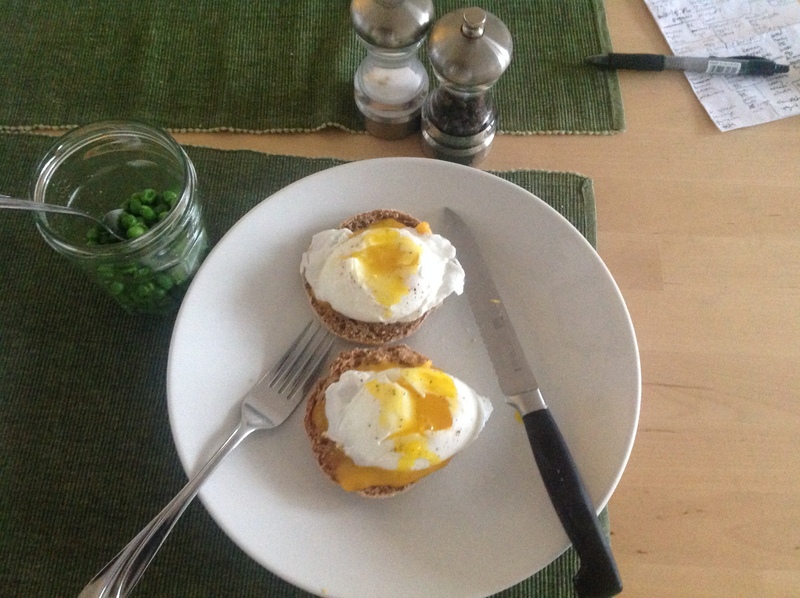 One of my favorite simple pleasures of late: poached eggs. Lately I’ve found comfort in this simple, delicious, and self-affirming recipe that helps for this soul-searching time of my life. I present to you poached eggs: soft and delicate, unctuous and smooth, perfect to top your toast, no special poaching pan required. Enjoy. Start by heating a few inches of water with about 2 tablespoons of vinegar* in a large skillet. Meanwhile crack your eggs into one small bowl (if you are doing 2) or a few coffee mugs with handles if you are doing 4 or more. (ATK’s recipe allows up to 8 eggs at a time without changing the cooking time). As soon as the water boils, turn off the heat and remove from the hot burner and gently lower your eggs into the now simmering water, holding the handles of the coffee mugs so you can add all eggs at once. Cover the pan and set your timer for 4 minutes (if doing 2 eggs I find this is perfect) or 5 minutes (if doing 4 or more). Prepare a plate with a paper towel and slotted spoon and get your toast ready. When the timer goes off, remove the lid and carefully spoon out each egg with the slotted spoon onto the paper-towel lined plate. Sprinkle with salt and pepper and transfer to your toast or eating plate. Enjoy poking the centers and letting the golden yolks run free. Close your eyes and savor this passage of time. *I have used apple cider vinegar successfully though ATK recommends white vinegar. The vinegar will not make your eggs taste sour and instead is used to help the eggs to come together when dropped into the water bath. If you leave it out, I can’t promise that you won’t end up with watery egg drop soup instead. I like to move, to be in motion. There’s something about sitting down or standing still that makes me feel like my life is stuck, like I’m stuck in slow motion, no motion, like my life isn’t progressing. That’s why I like to run and bike and walk and cook and why I like to get into the city and see other people moving. It makes me feel like I’m doing something, even if all I’m doing is getting out of the house for a moment. This time of year, despite resolutions of trying harder and being better and scraping the last drop, I find myself more often than not trapped inside, unhappy with my day and my future prospects. What am I doing just sitting here staring at a screen? Why does my life feel so static? I make a to-do list to feel like I have things to accomplish, and instead I just stare at my list and wonder who is going to do these things. Is it the procrastinator in me that’s rebelling or is my list just not enticing enough? So instead I decide to make a done list for today to remind myself what I have accomplished. Then today while walking home with my groceries, I saw two people lugging their suitcases with them as they descended from the train and something occurred to me. Whether Bostonites returning home to their city or visitors from another state, I realized that to them in that moment I am just part of the motion of the city. I am part of the Green Line train carrying people to and fro, part of the people lugging their groceries home on a Saturday afternoon, and part of the just-trying-t0-make-it-through-the-day crowd. Seeing these travelers, I was reminded of that feeling when you return to a city after a long time away. People go about their daily business as if before you arrived someone had just called “ACTION!” and the movie scene had just begun (except that this is real life and you’re walking in right in the middle of it.) Instead of people frozen in time where you last left them (as you expected), people have gone on living. You have to remind yourself that when you leave somewhere, lives continue. These places are only put on pause in our minds until we visit them again. So what do you do in the doldrums of winter? In the doldrums of life when you feel static, motionless? If nothing else, keep moving. Go for a walk, pace around your house, throw yourself a dance party (JT: DP, DP!) but just keep moving. If you’re moving, you’re still living and if you’re moving you have at least one big thing to be grateful for: life, whether it feels like thrill runs through your veins or not. Sometimes you have to remind yourself, that despite those moments where life feels slow, I am part of the motion and then … keep moving. 2013 was a very good year. First, there were the weddings. Though I got engaged at the end of 2012, we began the real planning in 2013, deciding when and where we would get married and what was important to us. We also attended Sam’s brother’s wedding in Italy and had a chance to celebrate their love with them. Then there was Kitchensurfing, and with that the chance to express myself through food and have confidence in my skills as a chef, a menu planner, and event organizer. Though I started out gradually, I have learned from my experiences and I have more events ahead of me. In 2013 I started this blog, which began as something to pull me out of the thick doldrums of winter’s hold and has morphed into a form of expression and another chance to step out of my comfort zone and share my writing with whoever will listen (or read). In 2013 we moved to a new apartment. We faced the challenge of packing up and picking up large furniture in 90-something degree weather and being welcomed (very warmly) into an un-air-conditioned apartment with our two freaked out cats (it’s okay, they and we have both adjusted now and all of us love it here). There was the Boston Marathon bombing. There were more school shootings. There were typhoons, hurricanes, and tragedies to say the least, and these things made us grateful for all we have and all that we can give. 2014 will be an excellent year. 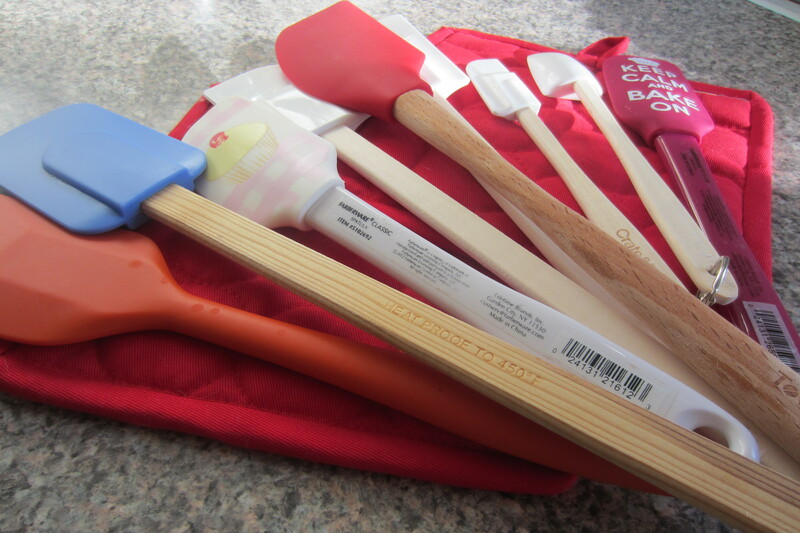 and I have been gifted an abundance of spatulas. 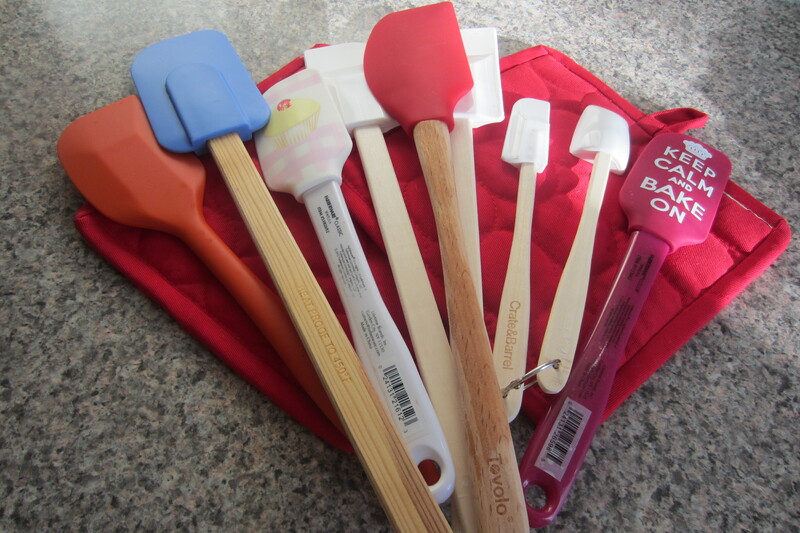 Red ones, blue ones, old ones, new ones – these spatulas will make my motto for the year. Scrape every last bit, enjoy life to the fullest, drink every last drop. Here’s to a year of health, happiness, adventures and triumphs even better than the last!